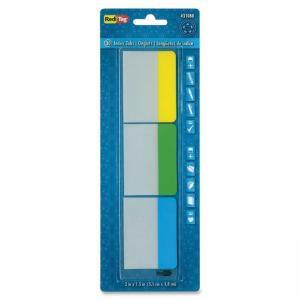 Make organizing your documents and files easy and colorful with durable, removable 2" tabs. Write on color area for notes or tabbing and remove and reposition when you need to. Self-adhesive on the frosted end is removable so you won't harm your pages. Whether your task is to color-code paperwork, flag documents for reference, or highlight where edits are needed, these page flags are the eye-catching solution you need. Colors include 30 each of yellow, green and blue.